Sharp has launched two high-end iPod docking stereos: the DK-A1H and the DK-A10H. Both sport an array of features including AM/FM radio with RDS. The DK-A1H and DK-A10H deliver crystal clear sound and deep bass through high-performance two-way bass reflex speakers and built-in subwoofers. They feature Sharp's new E-sound technology which uses a digital signal processor (DSP) to enhance the sound quality of compressed audio files. It also generates "a dynamic 3D surround sound", according to the company. An electronic 6-step equaliser customises the sound to the music genre as well, so that all your tunes will be played at their optimum level. As always, the docking stations will charge your iPod when it's connected. 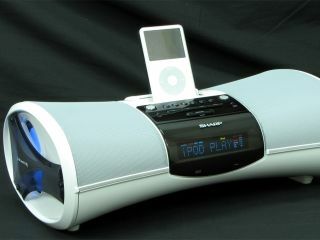 Songs can be selected either from the iPod itself or by using the operating controls on the docking station. Or you can use the small remote control which comes with either model should you not want to move from the comfort of your chair. The DK-A1H and DK-A10H also have a line-in function at the back of the stereo so you can connect up other devices through the AUX input and video outputs. The docking stations recognise CDA, MP3 and WMA formats, while the DK-A10H can play both standard CDs and rewritable CD-RWs. They'll be available from June and come in either white or black, retailing at £150 (DK-A1H) and £200 (DK-A10H).